While doing some online shopping on the Ulta website a few weeks ago, I came across this O.P.I. 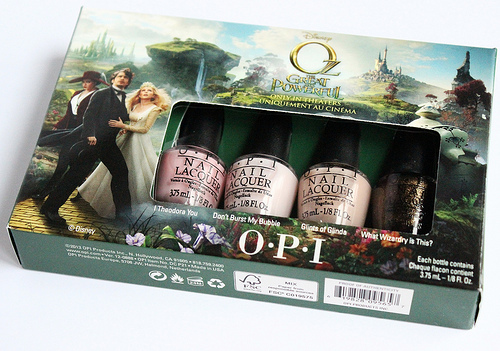 mini nail set which contains colors from their OZ The Great And Powerful collection. The shades are I Theodora You, Don't Burst My Bubble, Glints Of Glinda, and What Wizardry Is This?, which is a liquid sand. I love mini nail polish sets like these because it allows you to trial a few shades from a collection, without having to get the fuller size bottles. 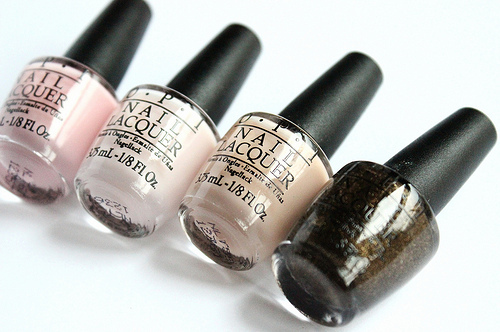 If you love neutrals that are on the sheer side, these nail colors are sure to please. Personally, I am quite fond of sheer neutrals, so it only seemed fitting that I order myself this set. I don't see this nail set on the Ulta website anymore, but the fuller size bottles of these are still available, in case any of you fancy a couple of the shades in the set. L-R: I Theodora You, Don't Burst My Bubble, Glints Of Glinda, What Wizardry Is This? Swatches From L-R (3 Coats Each): I Theodora You, Don't Burst My Bubble, Glints Of Glinda, What Wizardry Is This? I Theodora You: Milky pink creme. This milky pink is one of my favorites in the set. Even though the color has a sheer base, the pink tone still peeks through and adds a girly touch to an otherwise basic shade. I found this one to be the most prone to streaking. Don't Burst My Bubble: White/beige creme. I love colors like this one when I am going for an understated nail look. Shades like this are always nice to have at hand, and I think they flatter everyone. I did experience some streaking with this one but not as bad as with I Theodora You. Glints Of Glinda: Beige/brown creme. This one is my least favorite of the bunch. I tend to avoid sheer, brown-toned nail colors because I find them to look the most unflattering on me. Also, the color seems to alter the whites of my tips and makes them appear yellow! It's such a shame that I am not fond of this shade as it applied beautifully, with no streaks in sight. What Wizardry Is This? : Murky golden taupe with small glitters/shimmer. I was most excited about trying this new liquid sand formulation. The effect is actually pretty cool and unlike any other nail polish I have used. Once dry, the nail polish has a semi-matte grainy texture, that feels gritty to the touch. One coat yielded a semi-sheer coverage, but 2-3 coats will result in a nice opaque saturation of color. The removal process of this one wasn't as bad as I thought it would be. I did have to put a little work in but, this was definitely easier to remove than a traditional glitter polish. 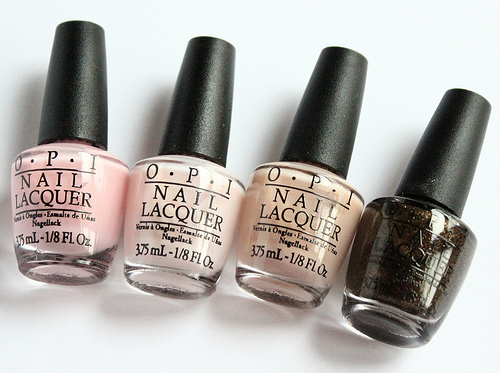 What do you all think of these nail colors from O.P.I. 's OZ The Great And Powerful Mini Nail Set?